Are your posts on facebook garnering only a handful of "likes" and shares? If so, it's time for you to consider boosting posts (or, consider using alternate means to advertise your event, such as email lists). A few years ago, Facebook encouraged many companies and organizations to gather as many Facebook fans and "likes" to their pages as possible. The benefit was that anyone who "liked" your page would see your updates right in their personal Facebook newsfeed as soon as you posted. Have a certain dog come into your rescue that needed medical care? Post about it on Facebook and all of your thousands of followers would get the message to donate. Many organizations quickly ditched their email lists in favor for this far easier and quicker method of marketing. In 2014, it all changed. Facebook suddenly cut back on the organic reach of company/organization Facebook posts, focusing on what they call quality content and post engagement. In other words, if you create a post that has a high number of likes, comments, or shares, then more people are likely to see it in their newsfeed. If your post doesn't have a high number of likes, comments, or shares... then it languishes, most likely only to be seen by maybe 2-5% of your Facebook audience (your audience being those who have liked your page). 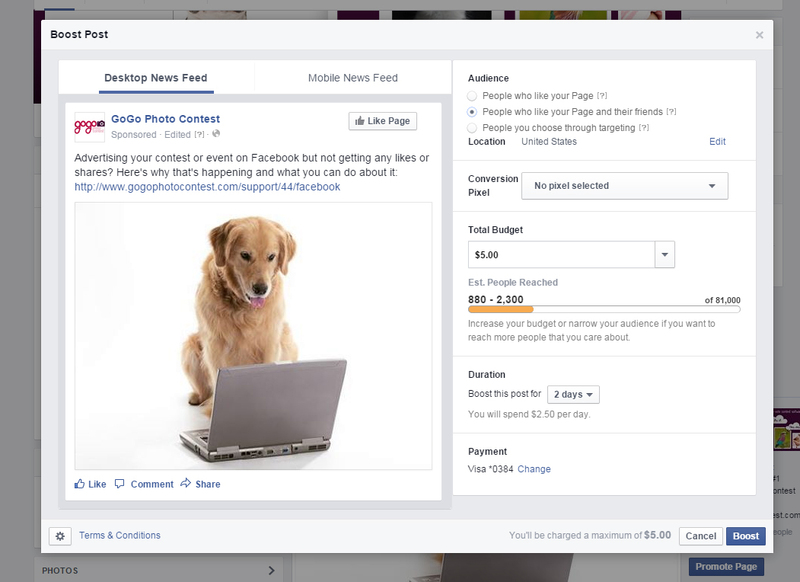 This new era of Facebook marketing can be best summed up as: You Have to Pay to Play. 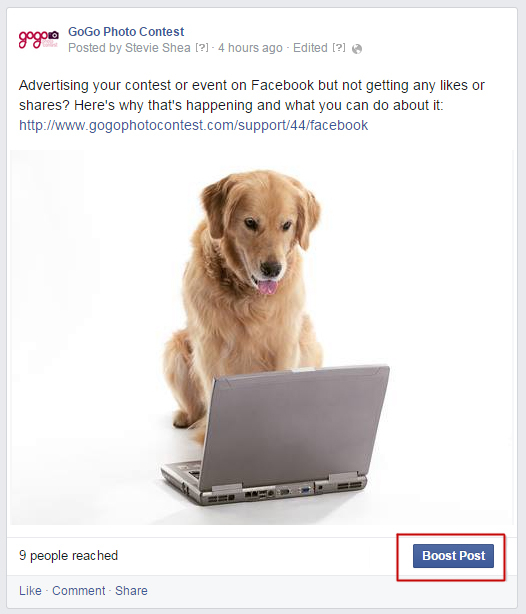 While posting to your Facebook page is free, we recommend that you use the "Boost Post" advertising option Facebook makes available to ensure that your contest is getting out to your entire audience. It's easy to tell if your organic reach is down- You may have 7,000 likes on Facebook, yet the posts you make may only garner 10 or 15 likes from your audience. This means that only 2-5% of your Facebook audience are seeing the posts you make. What Sort of Posts Should I Boost? We recommend boosting posts that entice people into entering your contest. At the very least, you should boost the very first post that you make that's announcing your contest. Make sure to include a cute photo or your contest banner with your post! How Do I Boost a Post? For Audience, we recommend "People who like your Page and their friends" for the broadest reach. You can play around with the other items, such as budget, duration, then click Boost. How Many Posts Should I Boost? We recommend boosting 1-3 posts throughout the duration of your contest: a post announcing your photo contest, a post in the middle (when participation may be dropping off), and a post at the very end reminding participants that the contest is coming to a close. 1) Change your Facebook cover photo to the banner for your photo contest. 2) Post about the contest often- if not daily, at least 2-3 times a week. Talk about the current entrants, prizes, etc (see Other Facebook Posts below). 3) Encourage other members of your rescue group/organization/shelter to "like" and share the posts you make about the contest. The more "likes" and shares a post has, the chances increase of your post appearing on the newsfeed of your other followers. If you have any sponsors, encourage them to share posts you make about the contest to their Facebook pages. You should also considering email marketing, if you have any email lists. 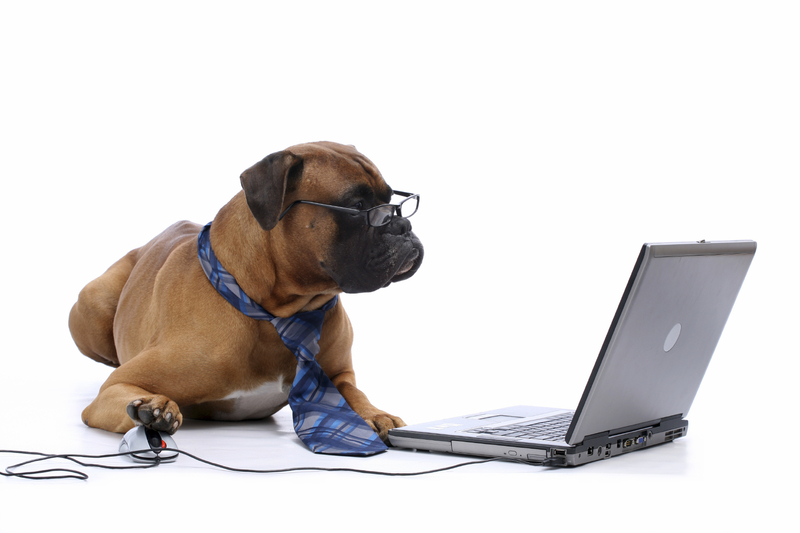 If you don't have email lists, it's time that you consider compiling one. Many organizations abandoned email as a means to reach their constituents, but in the age of boosted/promoted Facebook posts, it's perhaps time to return to this way of spreading your message. Boosting Facebook posts increases the reach of your post, ensuring that you're effectively reaching your audience and their friends, which should in turn increase participation in your photo contest or event. Last note: The team at GoGo Photo Contest doesn't agree with the fact that non-profits (which are the majority of the organizations we work with) have to pay to reach their Facebook audience, but that doesn't change the reality of how Facebook now works. We hope that some day Facebook reduces advertising costs for non-profits, either by directly reducing the cost or by providing advertising grants.